The Series CX Compressor Pressure Switches are designed with a 20 amp normally closed SPST switch for direct control of pumps and motors. The set point and deadband are both easily adjustable via screw terminals inside the cover. 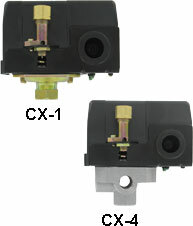 For ease of installation, the switches come with a 1/4˝ female NPT process connection or the optional 4-port connection block on the CX-4 models. Besides making installation easier, one of the other ports can be used to install a pressure gage. Plus, these switches can be mounted in any orientation. that can be pushed to turn on the load. Wetted Materials: NBR (Nitrile-Butadiene) rubber diaphragm, steel connection (CX-1), aluminum alloy connection (CX-4). Pressure Limits: See model table below. Switch Type: 2 each SPST snap action, normally closed (NC). Electrical Ratings: 20A @ 120 VAC, 12A @ 240 VAC, 9.6A @ 240 VAC (3 phase), 8.6A @ 32 VDC, 3.1A @ 120 VDC, 1.6A @ 240 VDC. 1.5 HP @ 120 VAC, 2 HP @ 240 VAC, 3 HP @ 240 VAC (3 phase), 0.25 HP @ 32/120/240 VDC. Process Connection: 1/4˝ female NPT (CX-4: 4 places). Weight: CX-1: 0.78 lb (0.35 kg); CX-4: 1.03 lb (0.47 kg). Agency Approval: CE, UL pending.